$200 for replacing the pure copper or pure silver wire. $300 to replace both the pure copper and pure silver wire. $420 if the broken gold wire needs to be remolded into one wire and the other wires need replacing. Shipping and insurance are additional. For broken copper or silver wires we replace them with completely new pure silver and / or copper wires. Only a broken gold wire will be melted down and remade. We do not take away or add any weight to your bangle and understand the importance of maintaining the weights of the metals. 1. Email us at: banglerepair@gmail.com or call us at: 760-704-8400 and ask for Rich or Nick to discuss the repair and let us know you will be sending the bangle. See below for a note regarding international shipping. 3. The repair process usually takes 2-4 weeks depending on our workload. 4. After the repair is complete we will bill your credit card, send you the tracking number and ship your bangle back to you. 5. Enjoy your fully repaired, like-new bangle! Important Notice: At times microscopic cracks are present in a seemingly good wire which will eventually cause it to crack and break. 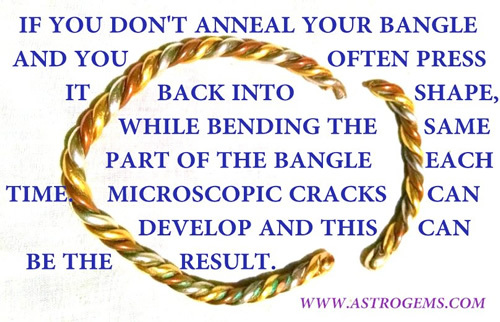 This occurs in about one out of twenty bangles and can be unseen until the repair process has begun. If microscopic cracks are present in your bangle, we will send you a photo and recommend you replace that wire. We wish to provide bangle repairs to anyone who needs them, no matter where they are living in the world. Unfortunately, we cannot be liable for bangles which are lost or stolen while in transit internationally. We do follow all necessary saftey measures such as sending the package with full insurance and a signature confirmation. Thank you for your understanding in this matter. Q: My Bangle is completely snapped in half, can you repair it? A: Yes. Sometimes we receive a request to repair a three-metal wire bangle that has been completely broken in two. Usually this occurs when the copper wire wears down and breaks and the owner doesn't get it repaired. Eventually the silver wire may break and then even the gold wire can break as well if the owner does not anneal the metals regularly. 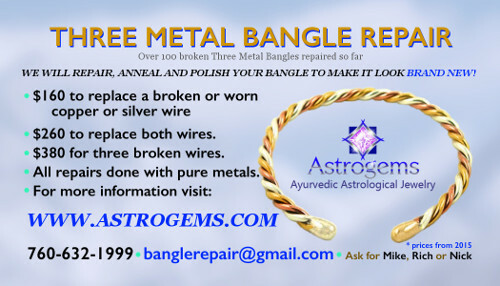 Some individuals have taken their broken three-metal wire bangle to a local jeweler who has incorrectly promised that they can repair it, when in fact all they do is solder the two ends of the wires together which is normally an inevitable path to future breakage. Very, very seldom will soldering the wires with a low temperature alloyed solder be a lasting solution. It also will not look very good. So often, SRF members have brought their bangles to me wondering why this repair job did not work. The reason is that solder is just not strong enough to handle the strain over such a small area of wire. Solder expands at a different rate to pure metals and this in itself starts the separating process. It is different with the melted alloy at the end of the bangles as they encompass the three wires in a more universal manner. 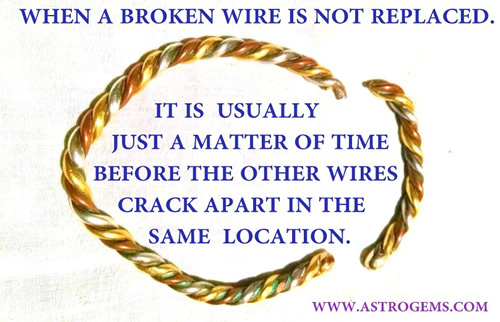 At Astrogems when we repair a bangle of this type, we do so by replacing the broken wire. In the case of a broken gold wire, we completely disassemble the bangle and melt down the two parts of the broken gold wire in order to fabricate the metal back into one pure gold wire. 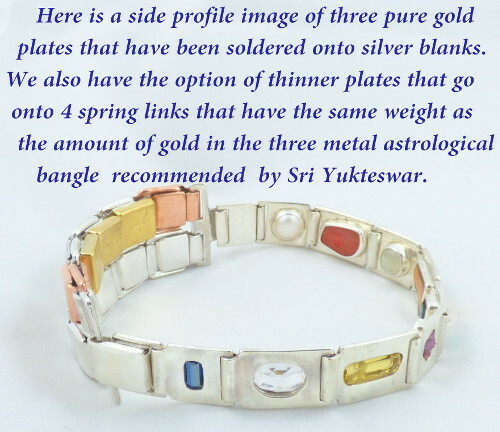 Q: Do you buy used broken three metal astrological bangles? A: We certainly do and we pay at least the gold value providing no other wires are broken or need replacing. The price will depend on the amount of labor required to return the bangle to new condition. If you are interested in selling one, please feel welcome to phone or email us. Ask for Nick at 760-632-1999 or by email at: askastrogems@gmail.com If you do send it, please be very sure to send it fully insured by UPS or FEDEX and not USPS. Please be sure to notify us before you send it so that we know it is coming. Q: I can not afford a three metal bangle on account of the cost of the gold. What do you recommend? 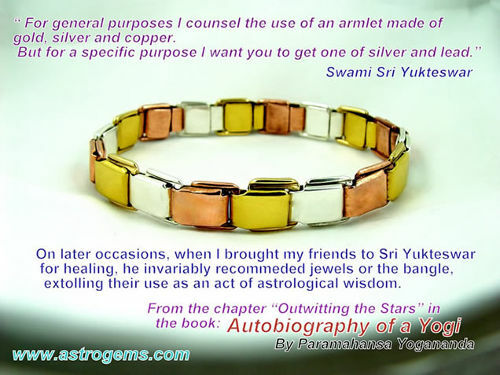 Sri Yukteswar said that jewels of not less than two carats are better than metals. And some are not that expensive. However it really surprises me that those that don't want to pay the high price for a three metal bangle, do not get a two metal bangle. The most comfortable design for this is our two metal spring link bangle made of pure copper and pure silver. The pure copper spring links are $8 and the pure silver spring links are $35. We would need the measurement of your arm or wrist to be able to customer make it for you. You can see the attached image to access how many links you would need. 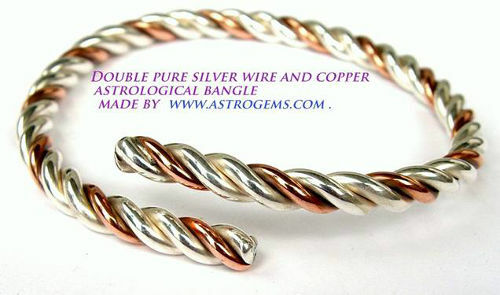 A lot of inexpensive copper bangles out there have tin mixed in , in order to give them a long term shiny shelf life . so if you do purchase a copper bangle at least be sure it tarnishes well and quickly which is one way of being sure it is probably copper. Pure silver jewelry is very hard to find as it is softer and not commonly sold. Hence we provide several products with pure silver.